Today, many companies are obsessed with digital marketing: web pages, emails, social media, native advertising, pay-per-click ads…. What has gotten lost in the shuffle is the cost-effectiveness and value of integrated marketing – using a combination of online and offline channels to build brand awareness and generate sales leads. In particular, integrating your direct mail and web strategies can pay big dividends. Several years ago, Harvard Business Week found that integrating direct mail and email provided noticeably better results for businesses than using either medium alone. On average, businesses increased their order value by more than $3 when using the two mediums combined, while also getting a 25% response rate. 2. Use a personalized URL (PURL). This can really enhance the user experience by moving someone from a personalized printed piece to a personalized web page. If your data supports it, you can program that web page with preferences you already know about the client. Once the client gets to this personalized microsite, your business can easily acquire individual responses and data. 3. Include social links. One of the easiest ways to integrate direct mail and the web is to add links to all of your social media platforms. (Check out this story of what Six Flags Great America did to effectively use multiple social media channels to create a stellar customer experience). 4. Take a hybrid approach. We’ve had excellent response from campaigns that lead off with a direct mail piece, followed by a series of emails. The direct mailer makes a strong first impression, which is then reinforced by several emails. 5. Expand your email list. Purchase a direct mail list of people who match the characteristics of your target audience. Send them a direct mail piece with a gated offer to download a special report, interview or other content asset that’s focused on their needs. Once you have their email address, you can send them emails to nurture them down the path to a sale. 6. 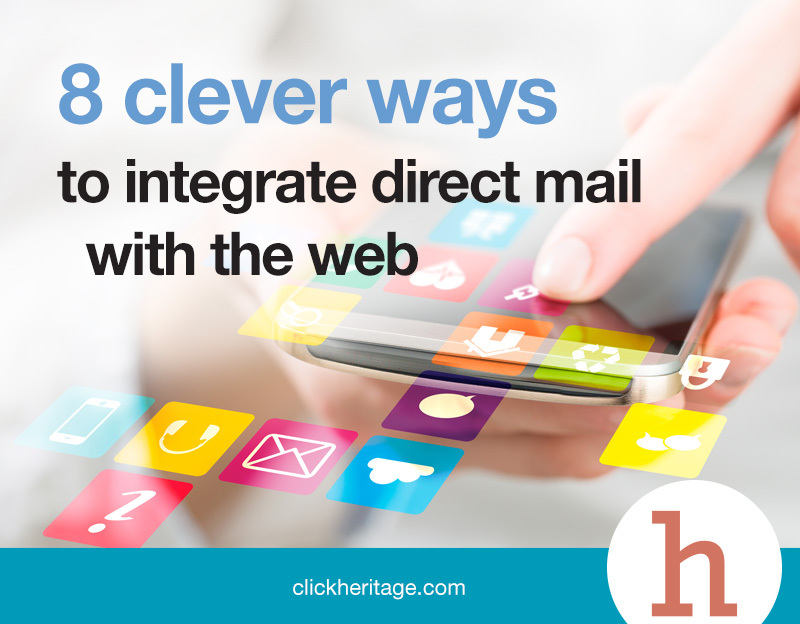 Use direct mail to trigger an email autoresponder. First, design a direct mail piece that offers a free report, eGuide or other valuable piece of content. It should point them to a landing page on your website that requires them to register to download it. When they do so, it can trigger an autoresponder email series that delivers a series of emails at pre-programmed intervals, designed to nurture them along the path to a sale. 7. Use direct mail to follow up on customers who have stopped responding online. Direct mail’s excellent open rate makes it a great tool for contacting prospects who haven’t been opening your emails. A single direct mail postcard can “reactivate” people in a way that email can’t. 8. Use direct mail as a re-engagement tool. If you have a key message that isn’t being read by email, segment your list into openers and non-openers and use direct mail to reach the people who aren’t opening your emails.